Welcome to Day 1013 of our Wisdom-Trek, and thank you for joining me. Hello, my friend, I am Guthrie Chamberlain, your captain on our journey to increase wisdom and create a living legacy. Thank you for joining us today as we explore wisdom on our 2nd millennium of podcasts. 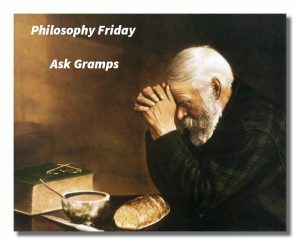 This is Day 1013 of our trek, and it is time for our Philosophy Friday series. 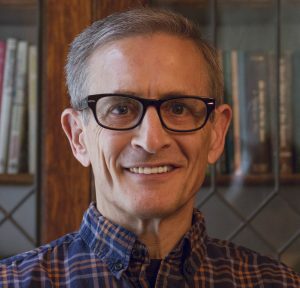 Each Friday we ponder some of the basic truths and mysteries of life and how they can impact us in creating our living legacy. 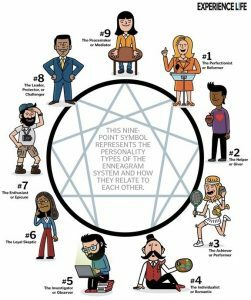 We have concluded our deep dive into the nine types which are “The Reformer,” “The Helper,”“The Achiever,” “The Individualist,” “The Investigator,” “The Loyalist,” “The Enthusiast,” “The Challenger,” and “The Peacemaker.” Three weeks ago, we began a series of episodes on Type Combinations, answering the question, “What are the potential relationship benefits and issues with each combination?” Covering all of the 45 different potential type combinations will take several weeks, but will be valuable in understanding each other, regardless of what type you are and what type those with whom you interact with each day are. 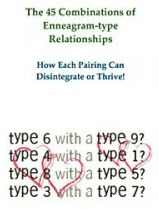 As with all double-type relationships, two Enneagram Twos bring many of the same qualities to each other. Therein lies both a main source of the attraction as well as one of the main pitfalls of this pair. Healthy Two couples bring a high level of warmth, affection, and sensitivity to each other. They are genuinely concerned about the welfare of their partner and of the relationship itself, and they are willing and able to put out a considerable amount of energy to make sure that all is well. A double Two pair has a high level of communication and checking in between them: two Twos would have no problem discussing how they feel, inquiring about the other’s health, how things are going at work, and so forth. They would also be delighted to help support the efforts of their partner in whatever ways they could. Both individually and as a couple, they are thoughtful, observant of people’s needs, generous, and respectful of boundaries and the need of others to be independent and to learn things on their own. Healthy Two couples can express enormous affection for others, while at the same time, letting them go appropriately. They also can find a balance between themselves as a couple and each of them as an individual. Interestingly, since neither is used to being nurtured by someone else, they generally need to learn to allow themselves to be loved and helped by the other. If each of the Twos can take in support of the other, the relationship can become a source of deep love and abundance from which they are able to more fully move out into the world. They feel secure and are loyal to each other, knowing that their partner is there for them. At their best, this is a loving, warm-hearted couple that uses the security of their relationship to raise a family, adopt children, and make the world a richer, more loving place. They reach out to others and build a family of choice, a home that others truly want to be a part of. A couple in which both people are so feeling-oriented may make better friends and work associates than they do intimate partners. The reason is that both are concerned with questions of value and self-worth, identity and gaining validation from others. 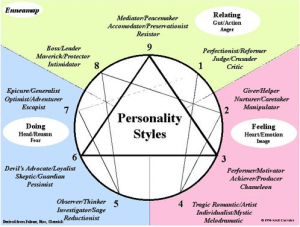 Their particular set of emotional needs can make this pair more prone toward secret jealousy and competition with each other about who is more loved, who is the center of attention, or who is being sought out more frequently for advice or for social events, and so forth. In some double Two couples, whether males or females, they are aware of how people respond to them physically and sexually. Different forms of charm to outright displays of sexual prowess are part of the picture although this will get in the way of a satisfactory exclusive intimate relationship. Some Twos attempt to solve this problem by going in the opposite direction by beginning not to care about what they look like. They may not exercise and gain excessive weight, for example, or not dress or groom themselves sufficiently. A double Two may begin to find their emotional consolations elsewhere, seeking intimacy with others or, if that is not possible, with food. 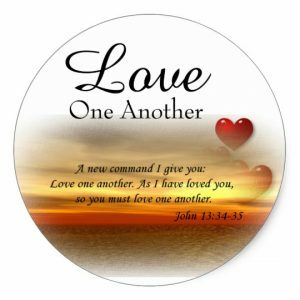 If this continues, they may gradually lose all physical interest in each other, and the relationship would suffer from loss of contact and physical intimacy. If health issues subsequently become a problem (due to overeating as a compensation for emotional deprivations), the physically healthier Two will inevitably feel held back by the needier partner. Or both Twos could deteriorate into a sickbed centered relationship in which their illnesses and their complaints about them are what hold the couple together. They may both develop boundary problems and get overly enmeshed with each other—or, just as likely, become repulsed by the other’s hovering. The worse this gets, ironically, the more isolated and lonely they become. Depression and blaming the other are often part of the picture. 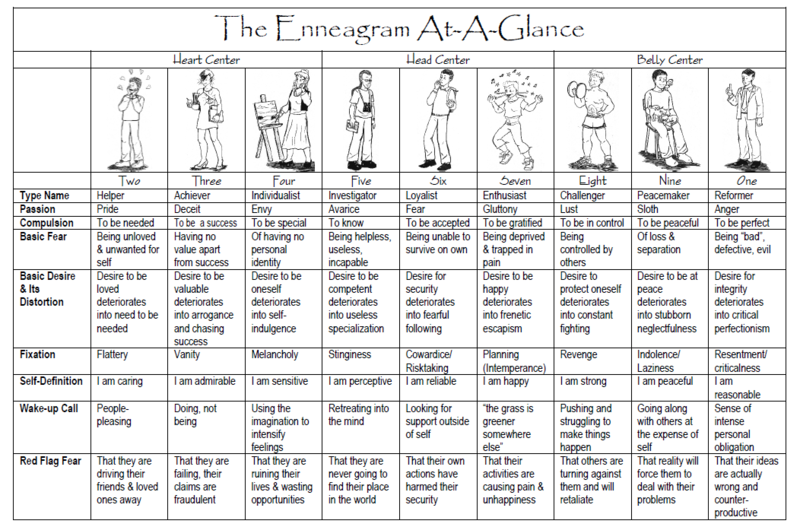 Both Enneagram Twos and Threes are driven by their feelings and emotional needs although this is not always apparent in the case of Threes. Both are also driven by their need for attention and the desire to be loved although this is not always apparent in the case of Twos. But for these reasons, both are oriented toward people and toward activities that will place them in the spotlight. This makes the Two/Three couple one of the most interpersonally attractive and impactful pairings possible. Individually and collectively, they are outgoing, sociable, high-spirited, charming, and often physically attractive. Both know how to make a favorable impression on people and to win them over. 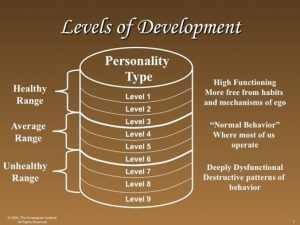 Each type brings energy, personal and social ambition, the ability to communicate with people, and the capacity to make others feel like they are the center of attention. Both know how to get people to like them and to rally support to achieve their goals. Twos, in particular, bring a more personal, individual focus to their interactions with others. They are thoughtful and follow up exchanges with genuine kindness and compassion. Threes bring flexibility, charm, practicality, and a goal-oriented vision for ways the couple can improve. Twos like to feel proud of their loved ones, and Threes want to make their partner proud. There is also a particular way that this pairing works as a team: Twos like to put the spotlight on others, and Threes like to be in the spotlight. Twos like to be the power behind the throne, and Threes can be happy being the point person for the couple. As long as healthy Threes appreciate the lavish attention of the Two, this arrangement can work well. In a sense, this is almost an ideal political couple—socially adept, energetic, virtually radiating charm and self-confidence, inviting others (by their manner and attractiveness) to join them in some way. Twos and Threes can be dazzling—a couple so widely admired and socially gifted that they become icons for their social sphere and time. A couple with such conscious star power also tends to be self-conscious—and even more conscious of each other. Twos get jealous and possessive of Threes. They can fall into an “I made you, you owe me” syndrome, feeling used and unappreciated. For all of their apparent willingness to take second place, Twos want to be recognized privately by their partners and to be made to feel that they are important. But Threes typically find it difficult to thank others for their success or to share the glory. Moreover, Threes may feel that Twos overestimate their contributions: they take credit for too much, sometimes embarrassingly, in public. As a result, Twos can start to undermine the Three’s confidence to get the Three to feel that he or she depends on the Two. Threes react quickly and strongly to perceived criticism and potential humiliation by distancing themselves—inevitably creating more anxiety and manipulation in the Two, a vicious cycle. Part of the problem is that both have underlying feelings of shame and vulnerability and they know each other’s weak spots and can play on them when they have to. Furthermore, potential conflicts can arise because neither Twos nor Threes are particularly introspective nor are they very interested in their own underlying motives. They simply assume that they are traveling in the same direction—toward increasing success and social validation-only to realize that they have drifted apart and may actually be at loggerheads with each other. Twos fundamentally feel that Threes put work and career before them, their children and home life, primary values for Twos. They feel that Threes are too focused on success and that they are missing the really valuable things in life. Threes, on the other hand, can feel stifled by the Two’s insistence on the need to invest time together. Threes feel Twos are smothering and emotionally manipulative, making them feel guilty for working hard and making the most of themselves. Intimacy deteriorates into bickering, and what it means to have a successful relationship becomes a real question. Disdain for each other can erupt into open hostilities. This can be a very warm, even passionate, couple when both parties continue to share their feelings openly together. Both are seeking warmth and connection, and both are willing to provide it when they are healthy. 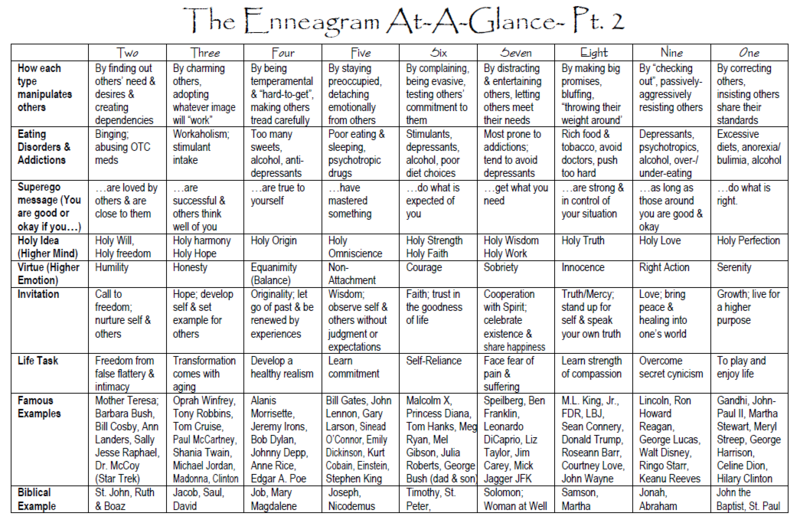 Hence, once they have gotten over the initial hurdles of intimacy, Enneagram Twos and Fours can be a safe place for each to share their hopes, fears, and insecurities. They can be good medicine for each other: Twos contribute sociability and energy, giving Fours the confidence to interact more easily with others. Twos are warm, outgoing, thoughtful and considerate, generous, and encouraging. Twos are also practical and action-oriented, willing to pitch in where needed and to do the things that need to be done–no matter how unpleasant or unglamorous. To this mix, Fours bring creativity, a sense of humor, a willingness to laugh at human foibles, and emotional honesty. They see their own craziness and their own falseness, and they do not try to varnish the truth of their quirks from themselves or from the Two. Fours also bring a sense of beauty and of subtlety into the relationship: they care about how things impact themselves and others, and so they go out of their way to arrange their world to be more aesthetically pleasing, allowing the Two to feel more relaxed and nurtured. Fours also bring emotional depth and sensitivity to their relationships, including a sense of mystery and unpredictability, sensuality and sexual freedom. In short, Fours invite Twos to take a closer look at their deeper needs–the truth of who they are and what they actually feel. Twos appreciate the subtleties and nuances that Fours bring, and Fours thrive in this atmosphere of appreciation. They can lighten up each other with unexpected humor and appreciation of each other’s quirks. Each invites the other to mature emotionally, usually without saying so. Both help the other to stop being so concerned about what others think of them and to become more inner-directed. Usually, Twos and Fours make better friends and colleagues than intimates. Surprisingly, this pairing is rare in intimate relationships. One would think that they would be a natural fit with each other: the rescuer (Two) and the rescued (Four), the lost child and the parental figure. The problem is that there can be too much emotionality and unspoken demands in this pairing for their own good. Twos and Fours tend to have many emotional issues in common-which allows them to understand each other readily while also laying the groundwork for potential problems and conflicts. They both need closeness and intimacy and tend to cling to anyone who responds to them sufficiently. Over the long term, there is the tendency to become competitive for attention or for one person to feel better liked and more appreciated than the other. Moreover, Twos tend to find Fours too moody and temperamental, led too much by their feelings and unconscious impulses. They also see Fours as hypersensitive and self-absorbed—and not interested enough in others or their welfare. Fours tend to find Twos to be too saccharine and artificially upbeat, flattering and insincere to get close to people and to feel needed. Fours see Twos as secretly emotionally needy, desperate for others to like them and seek them out. They can see the Two’s helpfulness as little more than an attempt to bribe people for love, which Fours disdain. Fours might begin to be secretly envious of the Twos social abilities, and the kinds of positive reactions Twos generally get from people. Fours can begin to feel socially inept and overshadowed by the charm and popularity of Twos. Secret shame and the feeling of worthlessness of the part of both can begin to undermine the relationship. It can founder on Fours’ feelings of abandonment if the Two becomes involved with others. It can also founder on Twos’ increasingly feeling unappreciated by the Four. Both begin to see the other as too emotionally needy—and ultimately as more demanding than each wishes to put effort into. 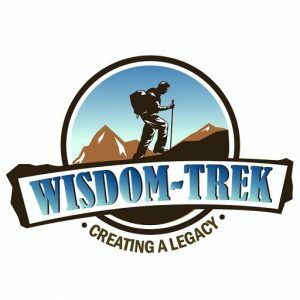 If you would like to listen to any of the past 1012 daily treks or read the associated journals, they are all available at Wisdom-Trek.com. I encourage you to subscribe to Apple Podcast or Google Play so that each day’s trek will be downloaded automatically.